If you were disappointed by your Christmas presents this year, don’t worry! WordPress has one more gift for you… version 3.0.4 which, naturally, contains a critical security update! That pair of socks your great-aunt gave you aren’t looking so bad now, are they? For those of you keeping score at home, that’s 3 security releases in a month, with the latest being the most severe and hitting smack in the middle of the holidays. Needless to say, this string of events doesn’t inspire much confidence in the platform. While I’m admittedly not privy to all the details regarding security efforts, one only need to look at the releases to see there’s a problem. WordPress version’s 2.8 and 2.9 both had several security related releases, and it seems the pattern has continued with 3.0. I’ve gone on record several times, both on this blog and on Twitter, calling for the WordPress foundation to hire more security experts to help the programmers like Mark Jaquith who already focuses on security. Unfortunately, the WordPress team doesn’t seem to agree. Andrew Nacin stated that more security experts would result in too many cooks in the kitchen. And Mark Jaquith pointed out that they already consult with external security experts. While many of the security issues addressed by recent releases have been relatively minor, requiring a would-be hacker to already have privileges to a WordPress installation in order to exploit the vulnerability, they still pose multiple problems. First of all, more and more elaborate and advanced sites are being built on the WordPress platform. As that trend progresses, even these minor security issues will affect more users and provide the potential for even greater damage. Secondly, and perhaps more importantly, these security issues pose a SERIOUS threat to how the platform is perceived. Most users don’t take the time to understand whether their sites were actually at risk when a security update is released. So, when users see 3 security related releases in less than a month, many begin to question whether their sites are safe on WordPress. This is essentially the same problem the community faces during all major hacking events. Whether the problem is with WordPress (as it is in the case of these security updates) or with a popular WordPress hosting company (as is usually the case), the platform’s image is what suffers. As I said before, I’m certainly not a part of the in-crowd when it comes to knowing the inner workings of the WordPress team. However, I was surprised to hear the team worked with outside experts on the issue of security. When coupled with the fact that many users associate any update with security, a common thread begins to emerge. It would behoove the folks that work on WordPress to spend a bit more time educating the average user about what steps are taken in regards to their site’s security. Explain what vulnerabilities are when they arise, make it clear when an update DOESN’T contain any security fixes, and maybe even expand the notification area within the WordPress admin panel to provide more information. 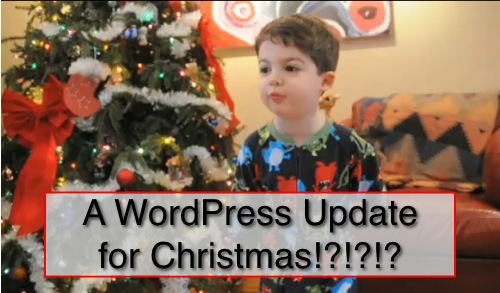 Basically, WordPress needs to engage in a full fledged PR campaign on the issue of security. Would hiring more security experts to work exclusively on WordPress.org help make the platform safer? I suspect it couldn’t hurt, but it certainly would be a major step in the right direction when it comes to public perception. When they decided to assert themselves over the GPL issue, I had clients asking me if they wanted to be on WordPress at all, asking what the fuss was about. It wasn’t that there was a GPL issue, it was the way that it was communicated. Chris, I’ve had clients asking me about security because every time they see the update bar in the admin panel, they assume it’s security related. Lately, I’ve not been able to tell them I’m wrong. Most of the security related issues lately have been pretty minor & probably don’t impact most sites, but the average (or perhaps slightly below average) user doesn’t know enough to know the difference between those minor ones & more serious issues like this one. Bottom line, I think better communication is DEFINITELY needed. What we need is greater input from security researchers on discovering unknown vulnerabilities, something we’ve been working toward. If that’s along the lines of a contract or audit, then that may work from time to time, but ultimately, it comes down to needing to engage the greater security community. Hiring a warm body or two isn’t going to help when at this scale security needs to be crowdsourced. The entire core team is meeting for about a week in January. I am sure security will be on the agenda. Your concerns are heard. It’s not that I disagree, I really don’t: We both recognize we need more input on security issues, just as any software project does. I’m just suggesting that outside input is going to be far more effective. And of course, there’s that perception issue. I’m sure we’ll be discussing that too. In terms of communication, I’d consider the call for help in the 3.0.4 announcement post to be a start. Jim, I’ll be honest, I don’t think that line sounds scary to the average user, rather reassurance. I could be totally off base, of course, but I think it says we care very seriously about security. I’m glad I’m not the only person that his worried about this. Don’t get me wrong, I’m very happy using their blogging platform but they could surely hire some extra help because we have had 4 security updates in the past month. So it took until last month to spot them.